While extreme anger is difficult to miss, it may be possible to observe very slight anger before the subject is aware that they are angry. Catching anger in the onset phase can be useful for defusing the situation. Lips: The lips may thin, press together, and stretch tighter. Jaw: The jaw may thrust or jut forward. Eyes: The eyes may narrow; the eyebrows may pull down and together, and upper and lower eyelid may tense. Pupils may also contract. Skin: The skin may flush. 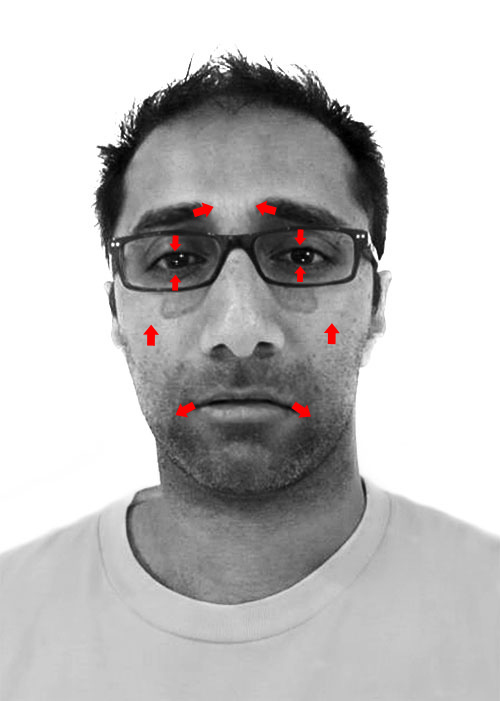 Contempt may be spotted as a unilateral expression - the sides of the face are uneven and is expressed by tightening one lip corner into a crooked smile. Disgust is a dangerous emotion because the subject feels very little compassion for what they are disgusted at. 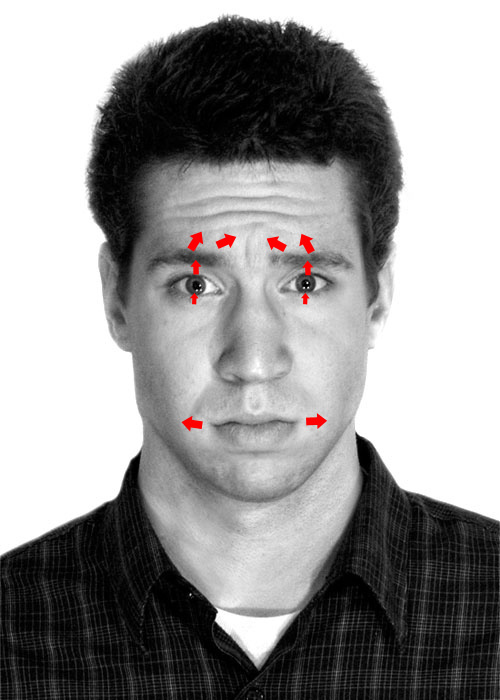 Lips: The lips may part slightly with the upper lip pulled upward. 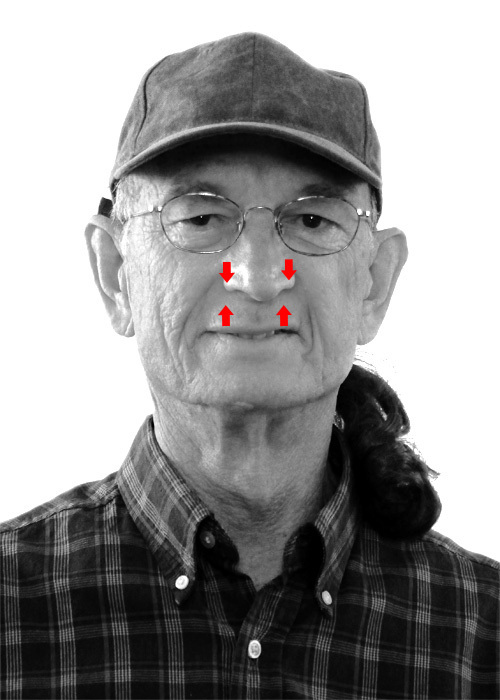 Nose: The nose may wrinkle and flare. Eyes: The eyes may narrow, pupils may constrict, and eyebrows may drop. Fear, in its slight form, is commonly missed in everyday interactions. Lips: The lips may stretch outward toward the ears. Jaw: The jaw may tuck back in toward the throat. Eyes: The eyes may widen, the lower lid may tense, and the eyebrows may pull up and together. Skin: The skin may blanch. Happiness is the easiest expression to falsify, and is a commonly used for social deception. A smile is often used to cover a negative emotion . Look closely for signs of negative emotions, incorrect onset and offset times, and incongruent actions or tones if you suspect that the subject is not happy. Lips: The corners of the mouth may be pulled upward in a smile. 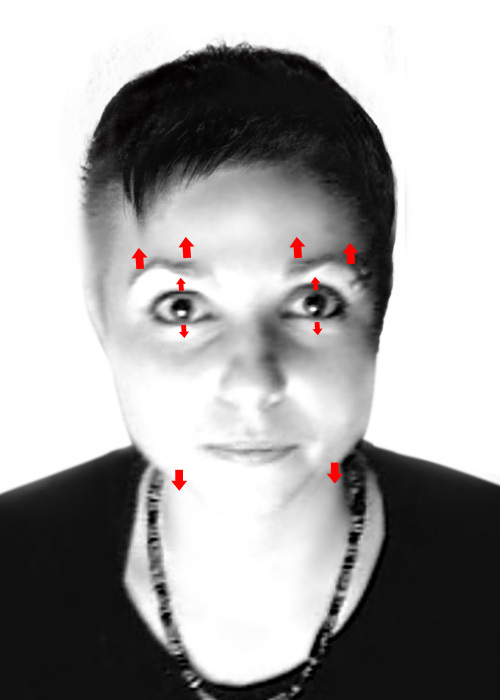 Eyes: The eyes may narrow as the cheeks get pushed up from the mouth. Wrinkles may appear beside the eyes. In its slighter or more controlled forms it may be mistaken for boredom or being tired. Lips: The mouth may be pulled down in a frown. Eyes: The eyelids may droop, the eyebrows may pull up and together. The eyes may look down. Jaw: The jaw may fall open. Surprise is one of the shortest lived emotions, usually lasting for less than a second.